Choose Standard UK Mainland Delivery at Checkout for Delivery within 4-5 Days (UK Mainland only). The Razor Pocket Mod 24v Electric Scooter - Vapour is fashionable and fun for that little person about the town (or pavement) with nifty retro-inspired styling, it embodies the classic Italian scooter design. 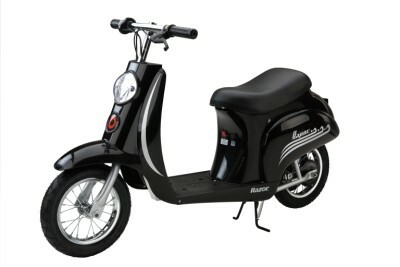 Not just a pretty black bonnet, this is a high performance run-around - with a chain-driven 250w electric motor and variable-speed acceleration this scooter can reach speeds of up to 15mph. Also featuring a pair of 30cm pneumatic tyres with a rear suspension system, riders are ensured a comfortable journey that can stretch to 10 miles or 30 minutes on a single charge.